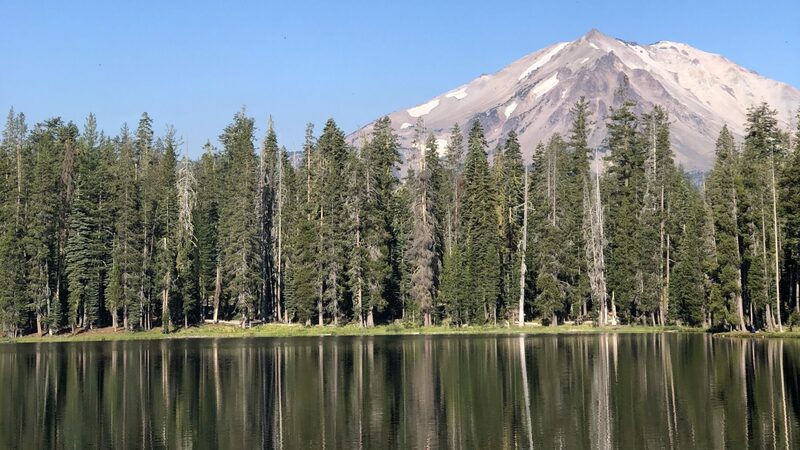 Did you know that Lassen Volcanic National Park in California includes seven trails that are part of the National Trails System? 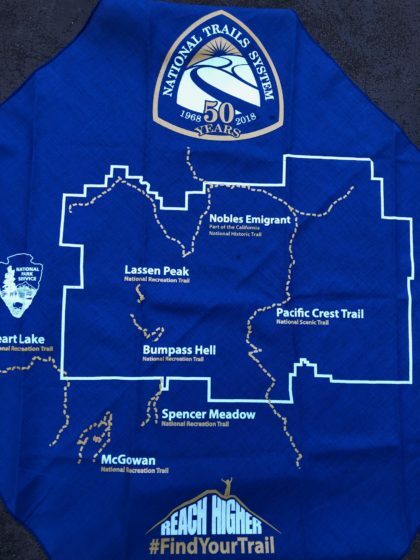 This year the National Park Service is celebrating the 50th anniversary of National Trails Systems Act, proclaimed by President Johnson in 1968, by giving anyone who hikes at least three of their trails a commemorative bandana. The National Trails System includes 11 National Scenic Trails and 19 National Historic Trails which were authorized by Congress, plus over 1200 National Recreation Trails. 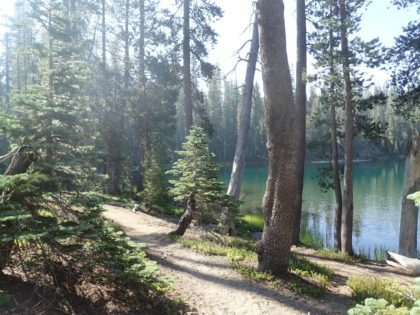 Pacific Crest Trail – this one goes 2650 miles from Mexico to Canada – only 17 miles is in Lassen. Hint: be sure to check current trail conditions and get permits as required. 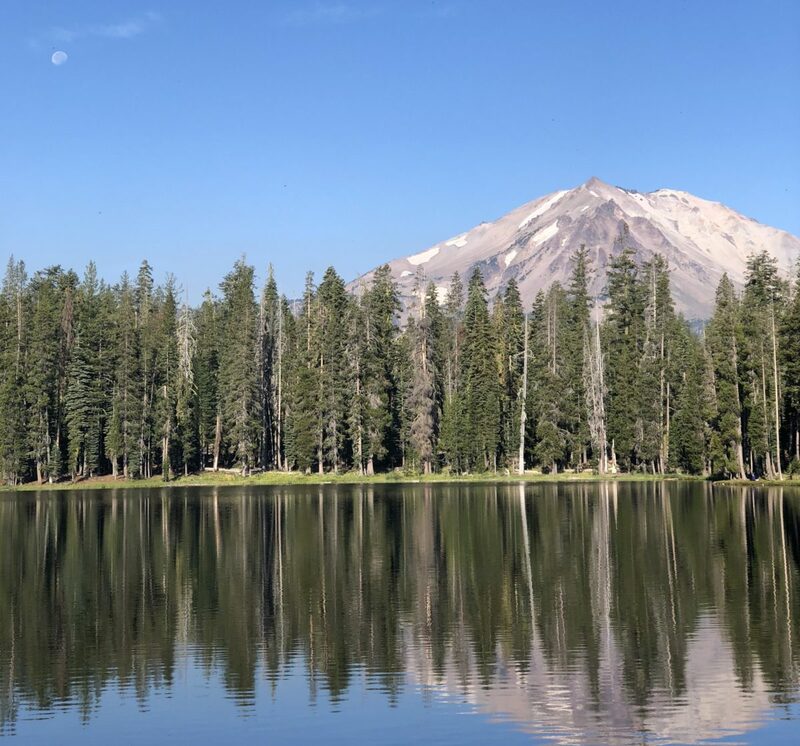 No matter what your preference, you can find an area of the park that you will enjoy – from clear mountain lakes to meadows full of wildflowers; or from barren volcanic domes to forested mountain slopes – Lassen has it all! Lassen is all about volcanos. 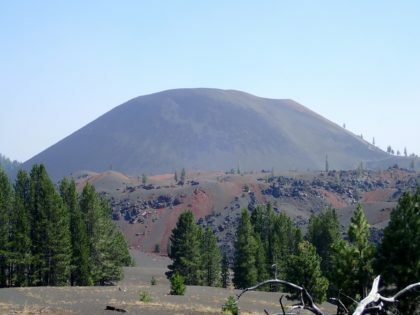 The park has all four types of volcanos… plug dome, cinder cone, shield volcano and composite volcano. The coolest thing we did was to hike up the cinder cone. It’s a tough hike – 3/4 miles from the base to the top, up a steep (30%+) grade on slippery rocks and cinders. But it is worth the climb. The view is incredible. You can see all the colors in the painted dunes and lava beds. 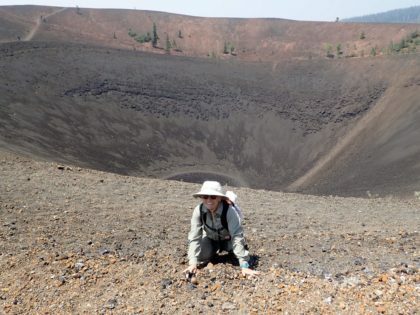 Plus you can go down inside of the cinder cone, into the caldera. It is a really neat experience. Lassen is not a heavily visited park – only about 1/2 a million visitors per year. It is tucked away in northern California, about three hours northeast of Sacramento and east of Redding. There are lots of places to stay nearby the park, or you can reserve a campsite or camping cabin in the park. We stayed at North Summit Lake – it was a lovely campground and a great place for a swim on a hot day! There are lots of clear mountain lakes in the park, some very good for fishing. Ask the ranger for the best places to go. HINT: Be sure to check the weather before you visit. You can never be quite sure of what you will find in Lassen. We went in July a few years ago and had snow; then this year we visited in July and had temperatures in the mid-70’s. There are over 150 miles of hiking trails in the park. 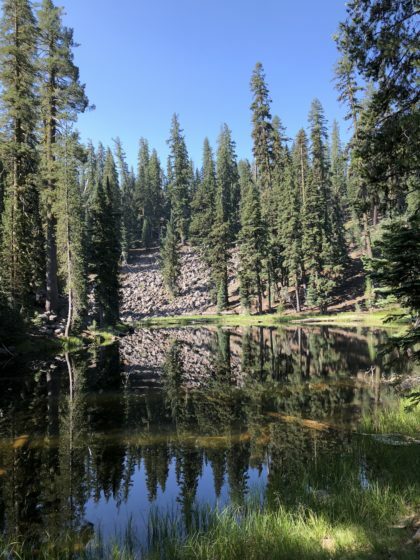 These range from easy hikes around Manzanita Lake on the north side of the park; walks to the mud pots / sulphur works in the south of the park; and forest hikes to crystal clear lakes from Summit Lake in the middle of the park. Lakes, waterfalls, hydrothermal systems… do it all! You can choose your distance and preference. There is something for everyone. Celebrate the 50th anniversary of the National Trail System. Pick a trail – any trail – and take a hike!